I knew that going to Iceland in the summer I would have a very little chance to see the northern light, so I kept my hope very low. Well, couple of day before the end of the trip, we were staying in a very nice hotel, ironically called Borealis Hotel. 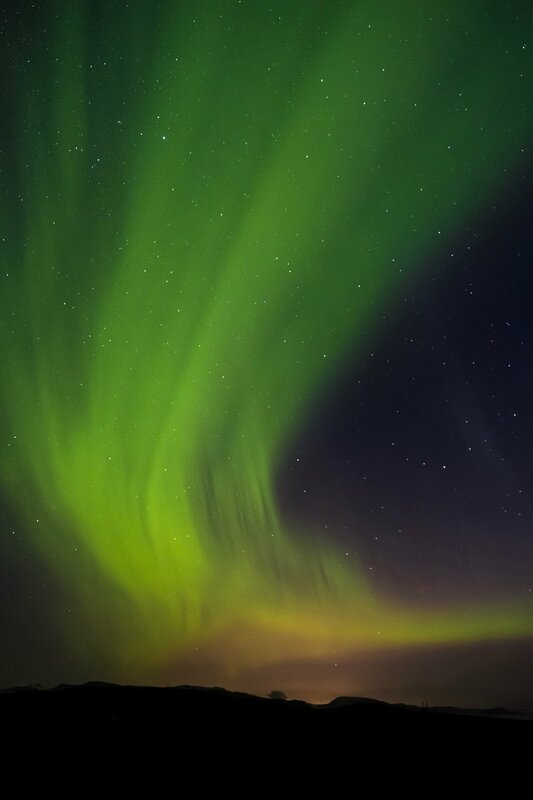 Well, the personnel mentioned that northern lights were visible the last three days and we could have high chance to see them the night if our staying as well! We was by skeptical, but of course excited to check it out! So we wait until 1am, and went out with our tripods and beloved cameras. The sky was pretty clean, and at the beginning we saw what we though was a large and long cloud on top of our head. We prepare to take some picture of the night sky, and suddenly what we though was white cloud, it turns vivid green in our camera LCD! We were looking all time at the northern light, but we couldn’t recognize them at first because we were expecting to see the typical green. After a while, in the dark, our eyes were getting used to it, and the green was slightly visibile with the naked eyes as well. It was amazing! Truly magical, this soft extra-planetary phenomenon was happening in space basically. I also wasn’t expecting to see it moving so fast, it changes form and shape very seconds, giving the photographer wait to recompose and frame the scenery differently. I was amaze by such a incredible natural phenomenon.